EMC's CEO and chairman Joe Tucci gave a keynote at Oracle OpenWorld 2013 on the transition occurring in IT and the data center of the future. There are four key macro trends driving the transformation in IT, said Tucci. These tremendously disruptive and opportunistic trends include mobility, cloud computing, big data, and social networking. 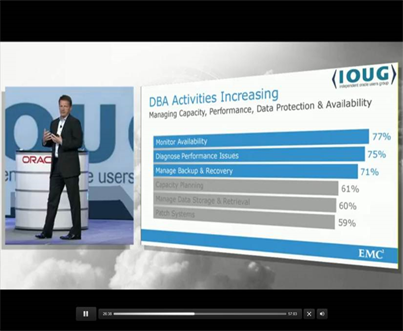 Jeremy Burton, EVP at EMC, cited a recent IOUG-Unisphere Research survey report which showed that the daily DBA activities most on the rise are systems monitoring, performance diagnosis, and managing backups and recovery. Oracle and EMC are integrating their technologies to allow customers to spend less time in the back office so they can devote more time to the front office dealing with more impactful business issues, said Burton. Following the mainframe era, and the client server era, now the end user device of choice is something mobile. “This introduces us to the third great platform of IT,” he said. EMC and Oracle are working hard to integrate their technologies. EMC’s Burton cited data on how DBAs are spending their time. According to the “Big Data Visionaries: 2013 IOUG Data Science Skills Survey” produced by Unisphere Research, among respondents defining themselves as DBAs in their formal job titles, the monitoring of system and platform availability (77%), the diagnosing of performance issues (75%), and the managing of backup and recovery (71%) are the tasks that are most on the rise. “We want to spend time integrating our infrastructure with the Oracle infrastructure so that you can spend less time [in the back office] and more time in the front office dealing with the business,” said Burton. As an example of the kind of work that EMC has done to achieve this, Burton pointed to an EMC plug-in for Oracle Enterprise Manager Cloud Control 12c which provides access to critical capabilities such as capacity in storage arrays and the ease of use of canned reports. To access a replay of Joe Tucci's keynote, go to www.emc.com/microsites/oow2013/index.htm?pid=hp-oow-230913.